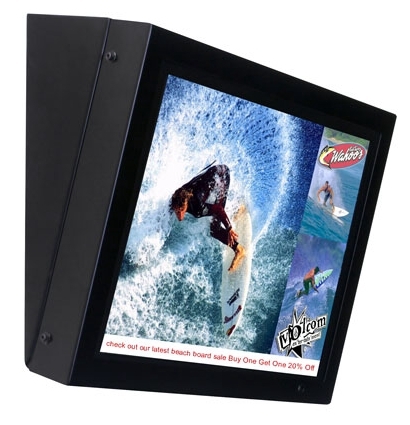 Our systems have a protective glass front that is securely set in front of the monitor/LCD screen. In case of damage it can easily be removed and replaced. The safety glass is inexpensive to replace and protects from any damage to the actual LCD signage. These systems are available with built-in operating systems that will play continuous content on a schedule or simply when powered on. We offer both stand-alone models and network updatable systems. Current applications include bathroom facilities on a network updateable platform. These systems are reliable and affordable. Available in most sizes from 10" to 15", 17", 19", and up to large format 42" and 50".